Amritavarsham 60 had a splendid array of kaleidoscopic cultural performances spread over three days – the haunting melody of the flute, the clarinet and the sitar, the entertaining duels of Jugalbandhi, divinely enchanting Odissi & Kuchipudi dances, soul-stirring Hindustani and Baul music, breathtaking Mridangam, feet tapping Bhangra, energizing Afro Fusion, rocking western music and, of course, traditional folk music & dance of Kerala. It was a beautiful garland strung with flowers of different hues offered at the Lotus Feet of Divine Mother. Or, shall we say a beautiful crown bedecked with different jewels to adorn the Queen of the Universe? One such jewel in her crown was Kavadiyattam. Kavadiyattam, a colourful ritual art, is a votive offering to Sree Subramanya. Basically of Tamil origin, Kavadiyattam is widely prevalent in the Subramanya temples all over Kerala during the festival seasons. Dressed in bright yellow or saffron robes, devotees performing kavadiyattam smear vibhoothi or sacred ash all over their body. Each one carries on his shoulder an ornate Kavadi – a huge bow, richly decorated with peacock feathers, (it is believed that the peacock is the vehicle of Sree Subramanya). Kavadiyattam literally means dance carrying a kavadi. The dancers twist and spin in a row, gradually move in a frenzy, in step with the rising beats of percussion instruments. Those of us expecting this “traditional” Kavadiyattam were in for a surprise! As the sun rose on the morning of Day 3, the humble group from Kozhikode blossomed on stage, slowly unraveling a performance par excellence. 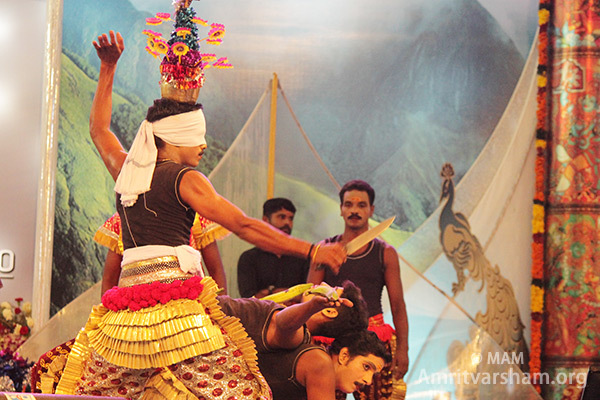 While the kavadis were indeed on display, with the traditional music & dance going on, one of the performers started his amazing show – a shocking display of various feats that left the audience speechless! It was as if Amma is giving a message – the human mind and body have immense potential; we need to cultivate them through practice, patience and perseverance. First was his walk over a ladder held horizontal by his teammates and picking up a soft drinks bottle with his mouth and emptying it. Well, what made this a “feat” is the fact that he was balancing a pot on his head all along, and his dancing steps accompanied the drum beats in perfect rhythm. It was beautiful to see the pot sliding on the head, as it went up and the drink went down his throat, all his movements never missing the rhythm of the music. As the tempo of the music increased, this highly talented artist’s demonstration became more and more spectacular. The best sequel was the ‘blindfolded act’. With blindfolded eyes, he was given a sharp knife. Another artist lay down with his hands outstretched, a banana in each palm. After a minute of concentration, the main artist cut the bananas to pieces! Next, bananas kept on the throat and stomach were shredded with clinical precision! What followed was a jaw-dropper! It showed the power of the mind, of concentration. As prayers arose spontaneously on the lips of the performers as well as the audience, the knife in the hands of the blindfolded one came crashing down on a coconut on the belly of the other, who was lying down! The coconut was cut exactly to two pieces! This was not the usual Kavadiyattam. This was something special – a unique gift from a relatively unknown (in comparison to the world-renowned artists who had performed thus far) group to their beloved Mother. And, Amma seemed to acknowledge it as she turned to look at them from time to time, even stopping darshan for a few seconds. May her blessings flow to this team and grace them with more and more success! 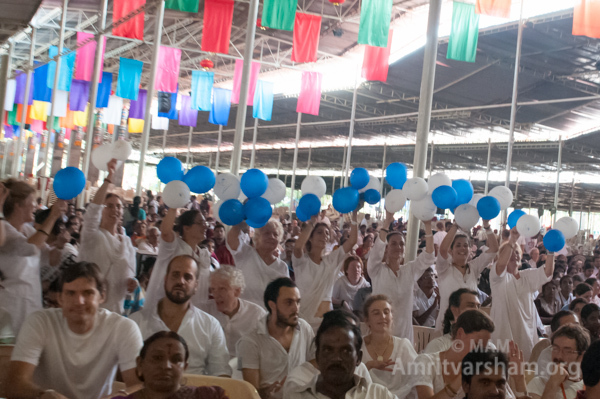 Amritapuri is where there are absolutely no differences of any kind – North co-exists with South, the East embraces the West and above all, Amma showers her compassionate hugs equally on one and all! Amritavarsham 60 (7:10 am 28th Sept morning) stood witness to this unity in diversity through the display of the famous Punjabi (North Indian) dance form – Bhangra – in this southernmost state of India. Bhangra is a lively dance from Punjab that looks a little like the folk dances found in Europe and is characterized by light steps and dance patterns. 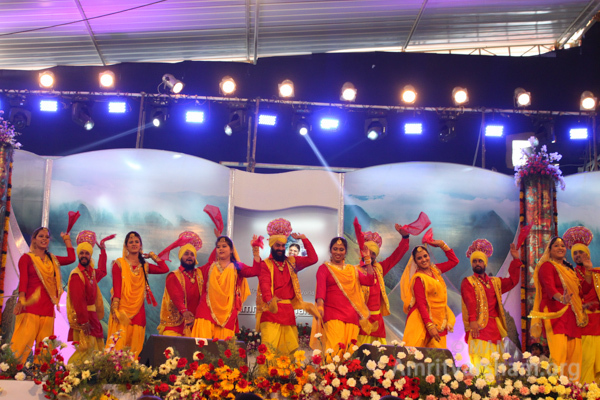 Team Mauj Punjabi (“Joy of Punjab”), led by Harpreet Singh, took the stage after a whole night of outstanding performances. 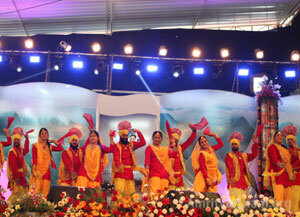 Harpreet and his team of energetic artists still managed to infuse a new lease of life energy into the audience! 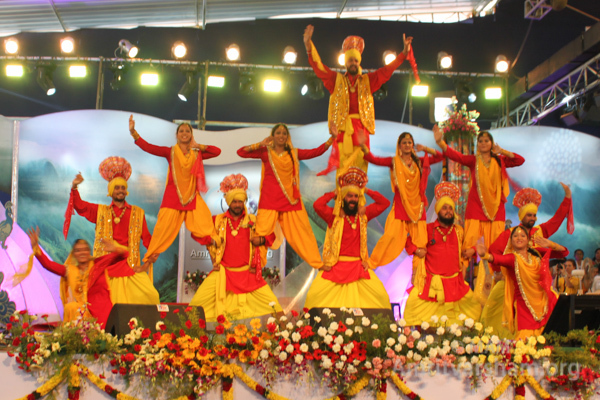 The troupe lit the stage with their bright traditional attire – Sardars in yellow kurta & red pagdi’s (turban – the pride of Punjab!) with the “feather in their cap” – the yellow turla. It was a literal wake-up call ….the drum beats ….the well-timed hoots & the cheer ….then, Harpreet poured out his heart “jisne jagat banaya” (“Who created this world”) …. “sauna sansar rachaya”(“created this beautiful world”) … Amma turns & looks on at this 6 footer devotee eulogizing his Mother! The tired feet slowly start to tap, naturally & effortlessly…. 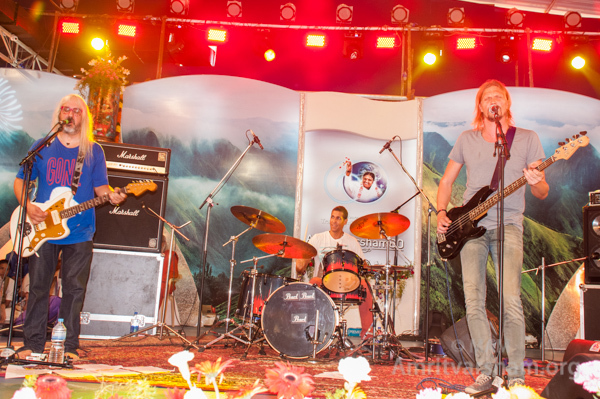 the audience was in complete tune with the hurrahs and the drum beats by now…. 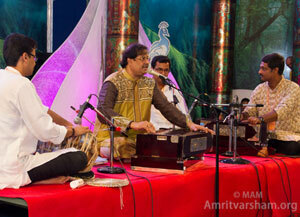 7 hefty Sardars on stage in Amritapuri! Then, 7 Sardarnis, clad in salwar kameez (traditional Punjabi dress) & chunnis (colorful pieces of cloth wrapped around the neck) too joined the men and it looked like we are in a village in Punjab. At one point of time, the beautiful, rhythmic steps seemed to be in sync with the darshan hugs….as the camera brought both Amma and the dancers on screen at the same time. Engaging music, feet tapping lively dance, colorful costumes and, above all, consciousness thriving at its best in these bodies… What a treat for Amma’s children! 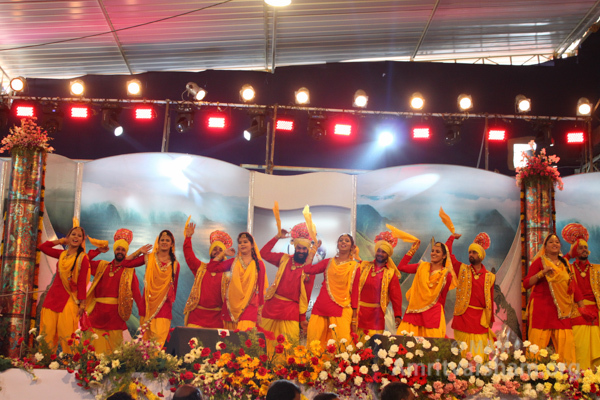 Towards the conclusion, the group shot their hands in the air in the typical Punjabi style, which reminded the devotees of the “mata rani ki jai” clarion call that Amma gives at the end of bhajans! Harpreet dedicated the usual “bari barsi khatan gaya si” bhangra call (“I was away (working) for a dozen years (& now back home)”) to Amma with this addition: “jad Amma aange…” (“When Amma comes, all troubles go away”). The finishing line was a request from Harpreet giving “badhai” (congratulations) to Amma on “Ammaji ka birthday” (her birthday) and called out to the audience to join him in singing “mata rani ne thi kripa barsaai….meri har ghal puri undi aai” … and, yes, to this joyous dancing in bliss, Amma’s children joined in full swing. Unlike the other performances, the story didn’t end here! The Punjabi spirit came out in full expression as, when Brahmachari Akshayamritaji presented the memento, Harpreet & team once again started the drum beats and made Swamiji dance! It was a pleasant surprise for the devotees to see the swami soon lifted up on two Sardars’ shoulders and the rest dancing around them. The joy inside Swamiji’s heart got outward expression as he danced along with them, bathing in the sweetness of their love! 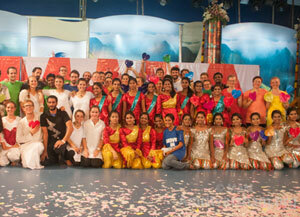 Where else can all this happen but in Amritapuri, in our beloved Amma’s presence?! AYUDH , or Amrita Yuva Dharma Dhara, which means “the youth which perpetuates the wheel of dharma (righteousness)”. AYUDH, founded in 1985 is the International youth movement of Mata Amritanandamayi Math. AYUDH seeks to empower young people to integrate universal values into their daily lives. Starting with themselves, AYUDH wants to help establish a future of hope, peace and social engagement while maintaining an awareness of spiritual principles. AYUDH started off their performance with some thought provoking rapping along with a fire dance. Aparna rapped (in malayalam) that nothing is impossible and we should embrace everything with the same amount of love and her control over the language, being a foreigner is worth mentioning. With colorful posters and beautiful transitions between dances, AYUDH captured the attention of the audience, and touched their hearts as well. The message that AYUDH wanted to convey is ” color the world with love”. Let the world be one! This was not a one -step destination; but a never ending unfoldment. The boundaries have to be broken and this has to start from within only then will the future be bright and peaceful. They ended the performance with a demonstration on women protection and some things that a woman could do to defend herself. It was a true picture of a challenge that women face in today’s society. This shows the commitment and concern that AYUDH has in issues relating to the society and their vision of a better world, where it is safe for our mothers, sisters and daughters. With Amma’s loving guidance and blessings, may AYUDH be able to spread the message of love and peace to society – on the wings of a dove. Speaking about coming to India to perform for Amma’s birthday, Mascis said, “I feel so grateful to get a chance to offer some songs to Amma on her 60th birthday. She’s given so much to this world. At least I can give this small thing to her.” In 2003, Mascis came to India and performed at Amma’s 50th birthday celebrations in Kochi. In 2005, he released J & Friends Sing and Chant to raise money to support the Mata Amritanandamayi Math’s relief-and-rehabilitation work following the 2005 Indian Ocean Tsunami. A morning full of beats, rhythm, drums and more! 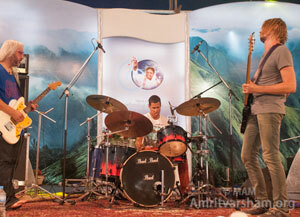 First the kavadyattam, then the Punjabi dhol and now the rocking drums, clubbed with the guitars! Herb filled the air with liveliness with his drum beats and solos. The rock band looked absolutely grand with the lightings in the background. 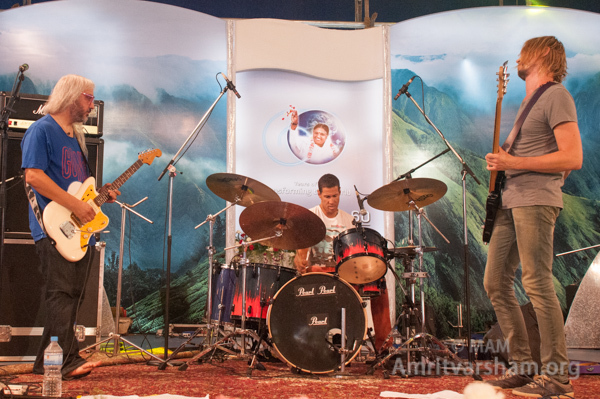 Their first song being “Amma Amma…” was a tribute to our Guru. The audience thoroughly enjoyed the rock band’s show! Amma’s western children could be particularly spotted dancing to the beats! As Mascis sang with his eyes closed, the devotion and love for Amma were flowing through his guitar, his mike and higher to the audience. One could feel the depth in his voice! A truly inspired performance! The trio totally enjoyed themselves, and so did everyone who was present there. What an energy filled morning of Amritavarsham’60! The view became further incredible when the rock band was surrounded with not only lights of different colors that seemed to change to the beat of the drums, but also the smoke rising into the air, giving the view of a real rock concert. 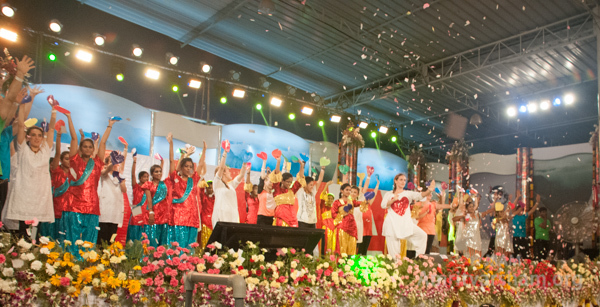 A few of Amma’s international Children joined in for the Song “Amma tell me…” left everyone mesmerized! It was the first time many of us witnessed a devotional song so perfectly blend with rock music. Then the famous composition of Mascis – “Help me Amma..Please”. Yes! In these difficult times, the Kaliyuga, all her children need her help, her guidance, her love! Balloons flying, people dancing, and clapping — yes, it was a birthday party. Amma’s birthday Party! 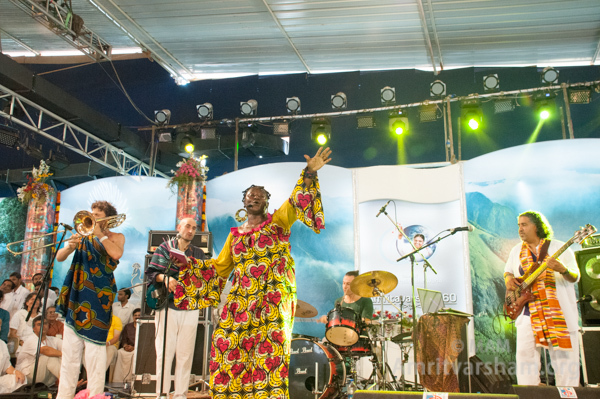 The devotees of Amritapuri were treated to a musical extravaganza, as they danced, young and old on the morning of the 28th to the tunes of Marie Philomene Nga. Marie Philomene Nga is a singer/actress from Cameroon. She now resides in France, working on movies and television shows. She has been traveling all over the world, trying to unite people with her music. She is currently working on an Indo African fusion project, as part of which she performed at the Alliance Francais in New Delhi. She was joined here by some of our very own ashramites! Dressed in traditional African garb she had with her an explosive array of instruments (trombone, balalaika, guitar, keyboards and drums). She had previously performed at Amritavarsham 50, and since then, has been a favorite among devotees. The audience loved her from the start, there was even a special team with balloons to cheer her on. A resonant, but dynamic voice that carried well into our hearts contained tons of expression of nothing but love. She sang always facing Amma, smiling as though in bliss (as the audience were). It was indeed like a birthday party, with balloons, people dancing and lots and lots of happiness! ‘Amma Baramma’ set the audience clapping harder than ever, as it was given an African twist, with lively expressions, laughter and a sweet smile on Marie’s face. When it reached the crescendo, it was truly a festival of love and devotion. She followed it up with another popular bhajan, ‘Parasahasra hrudayangalil dhyanikkunu’ that was a letter perfect rendering, without even a hint of accent. Such was her dedication and love in preparing for Amma. But the best was yet to come, with ‘He Amba Bol ‘ and an ensemble of other Kali bhajans like ‘Jai Jai Jai’ ,’Om Namah Shivaya’, bringing the audience to their feet singing and dancing ! The number, ‘Jaya Jagadambe was supposed to be the last one, but a smiling Amma motioned for her to continue. Such is the love of Amma — giving a chance to her children to enjoy together, as one. 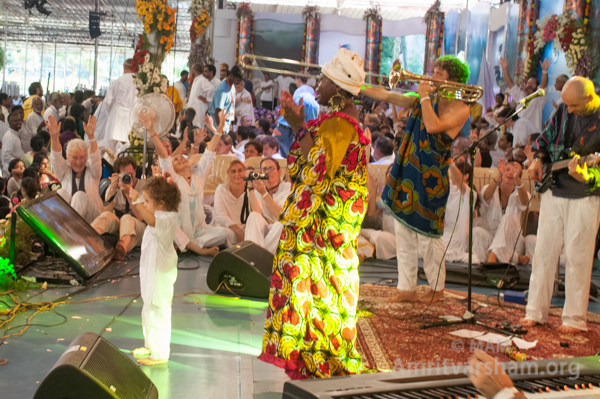 A three year old Aikyam joined on stage with Marie and it was indeed very cute watching them sing together in praise of Amma! 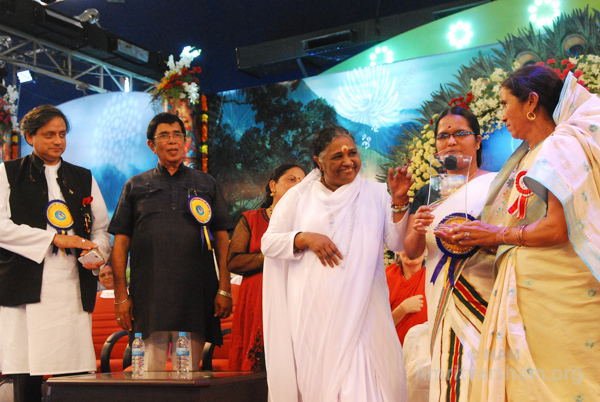 When presented with the memento, she simply turned to Amma, and touched her heart. ‘Amma, Amma, Amma’, she chanted, closing her eyes. As she sang ‘Happy Birthday’, her eyes moistened, and her face was filled with compassion. 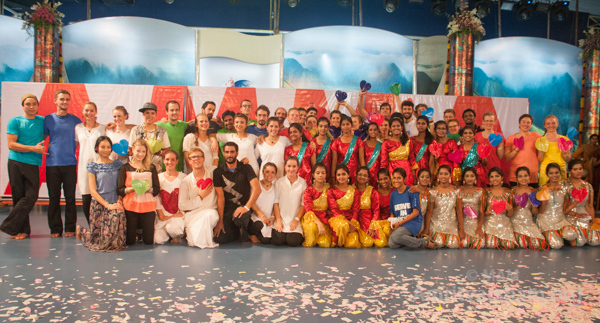 It was proof of the fact that the love of our beloved Amma can unite not just music, but people across the borders of the world. The first key focus area in this project is housing. In the flood-ravaged areas of Rudraprayag and Uttarkashi, MAM will build approximately 500 homes to replace all the homes destroyed by the floods in 42 villages. These will be built on sites provided by the Uttarakhand State Government. Kudikunnil Suresh, Hon. Minister of State for Labour, presented the plaque representing the MAM’s commitment to reconstructing these 500 homes to Rammoorthy, representative of Uttarakashi District in Uttarakhand. In an effort to empower the local communities, MAM will invest in establishing computerized vocational-education and training centres in the flood-ravaged communities. Smt. Shaila Rani Rawat, Honourable Member of Legislative Assembly for Kedarnath, presented a plaque representing the Math’s pledge to provide Women’s Empowerment & Vocational Education Training in the region to Shobender, representative of Uttarakashi District in Uttarakhand. Another key component of this project will be to enrol impoverished children from the affected villages into MAM Vidyamritam scholarship programme. 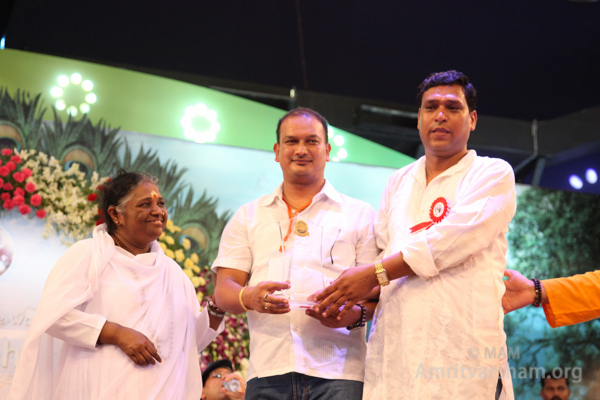 Veerender Rawat, Congress Leader (and representative of Harish Rawat, Union Minister for Water Resources), presented the plaque representing the MAM’s Vidyamritam pledge to representative Vikram Naghi of Rudraprayag District Uttarakhand. The fourth and final key area of this project is the provision of basic healthcare needs. 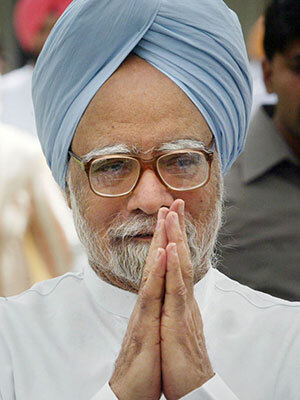 Adding to the 8,000 people who were provided free medical care immediately following the disaster, MAM will build medical centres to service the villagers in the affected region. Smt. P.K. Jayalakshmi, Hon. Minister of Scheduled Tribe, Gov. 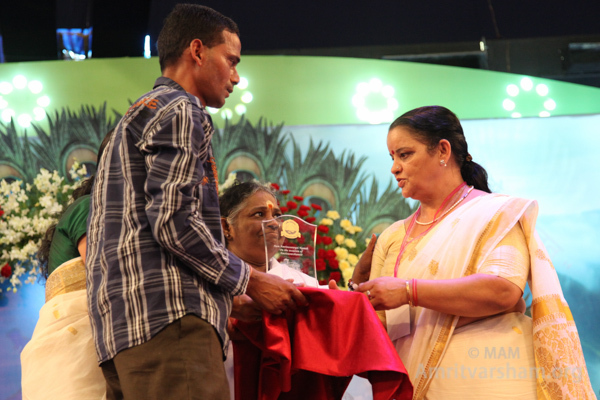 of Kerala, presented the plaque representing the MAM’s pledge to build healthcare centres in the region to Smt. Kurwani Bartwal representative of Rudraprayag District, Uttarakhand. 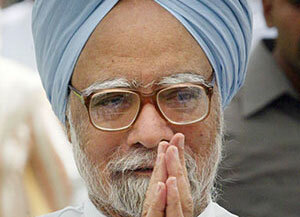 Hon President of India, Pranab Mukherjee’s Birthday Message to Amma on her 60th Birthday. I am glad to know that the 60th birth anniversary of Sri Mata Amritanandamayi Devi is being held at Amritapuri in Kerala. 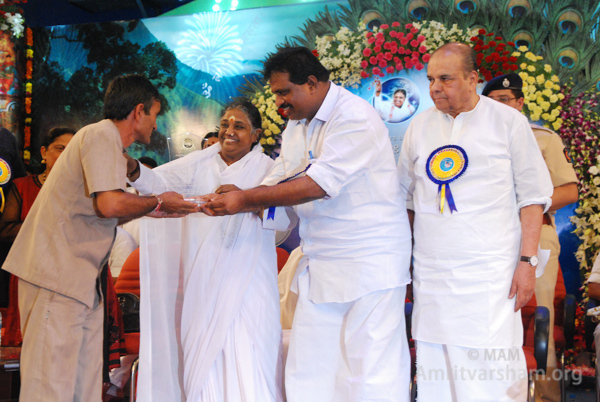 Mata Amritanandamayi is popularly known as “Amma” because of her love and compassion for all human beings, irrespective of their caste, creed and religion. The Math established by her is taking many pioneering initiatives to serve the humanity, both in Indian and abroad. On this happy occasion, I wish Mata Amritanandamayi Devi all happiness and also many more years of fruitful service to the mankind. The stage was adorned with flowered light patterns of varying colors. Bouquets of fresh flowers lined every part of the stage. The cameras covered every inch of the stage, giving devotees some amazing and powerful shots. Our beloved Amma’s 60th Birthday. 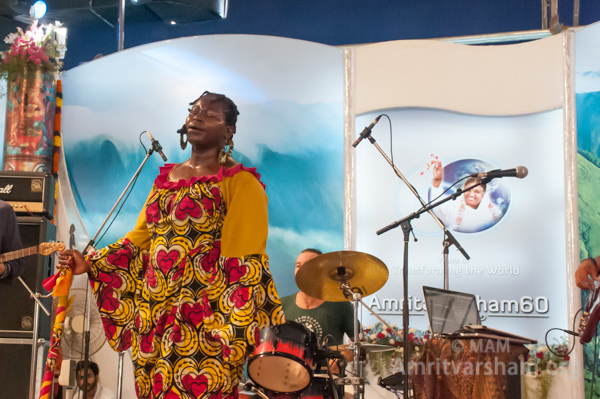 The air of divine love that exists here in Amritapuri was amplified by the soul stirring performance of Parvathi Baul, one of the most popular practitioners of Baul music all over the world. Parvathy Baul is a singer, painter and storyteller from West Bengal. After studying visual arts at the Kala Bhavan at Shantiniketan, she had the chance to come into contact with the living tradition of Baul. A huge turning point for her, she decided to undergo self training in Baul, rather than pursue a conventional degree (After listening to a mendicant on a suburban train, she set off to find her guru). She has performed in locations such as Paris, Beirut, Geneva and Japan. She has brought her talent down south to Kerala 15 years ago, under the guidance of her guru, Muslim fakir kalandar Abdul Salam, and also performs in remote villages in many parts of Kerala. Adorned in a simple sari, with her long flowing hair , her soulful voice rang across the hall, captivating all present there. She reminded of a sant from yesteryear India, traveling along, singing praises of the Lord. One hand playing the ektara (one stringed drone instrument) , the other playing the dugi (a small hand held drum), she moved across the stage rhythmically. Her powerful voice at times reached dizzying heights, and at times was a mere whisper. She rendered some melodious numbers, one was of Mata Kali, praising the dark skinned one for shedding light to the world; and then went a song that was the favorite of Sri Ramakrishna Paramahamsa. An animated performer, her smile, hand gestures and anklets chimed with her graceful movements. 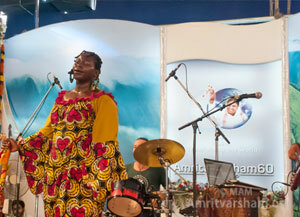 The audience too, were enthralled at piety, her sweet voice and the immensely spiritual environment. As she sang, “Janani! Janani!”, the audience could not help but feel the rush of divine vibration, with our beloved Janani sitting right there, giving darshan. 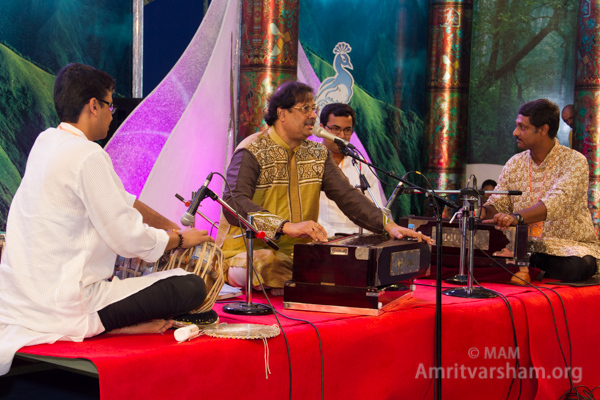 Amritavarsham 60 witnessed Amma’s bhajans and Abhangs by world famous Indian classical Hindustani vocalist, Pandit Ajoy Chakraborty on the same evening … a nectar flow for the ears of the devotees gathered here. • who has been spanning the cultural gulf between India and the west through extensive musical tours by adapting Indian Classical Music to a universal expression of feeling. His abhangs poured out bhakti (devotion) aptly starting with a sloka paying tribute to the Guru. The momentum picked up with an abhang on the praise of Lord Shiva. The sangathis and the modulations were simply astounding, with various combinations and offered complete justice to the Raaga. 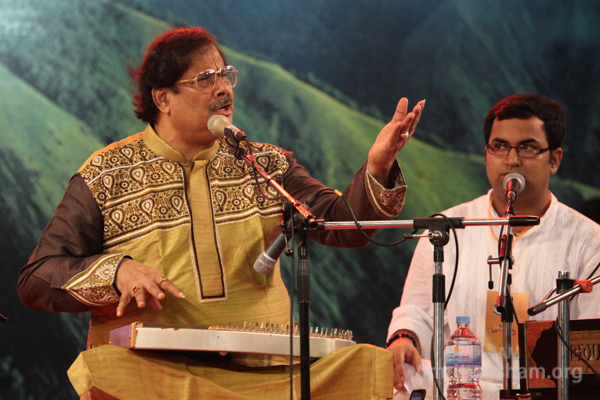 The melody and the vibrations of his voice mixed with the bhava, or the emotional energy, felt heavenly. The forty five minute concert had a fitting conclusion with a Tillana – a form of classical music, focused on “Thaala” (rhythm) notes, composed by the legendary Dr. Balamurali Krishna. Panditji paid his tribute to Amma: “I feel so lucky to come and touch Mother’s feet. It is my first time… I have never experienced such blessings ever in my life.” He offered pranams to Amma and poured adulations, saying “Amma is the Mother of the Universe, the mother of the country and the mother of the whole world. I pray to Almighty for world peace through her blessings”. Most notably inspiring were the lyrics of the main song – Moko kaha dhoondhu re bande main tho tere paas mein (“Where do you search for me oh humble seeker, I am within you!”). For Amma’s children, it is Mother’s call to seek her inside, enshrined in the devotee’s heart forever & forever.